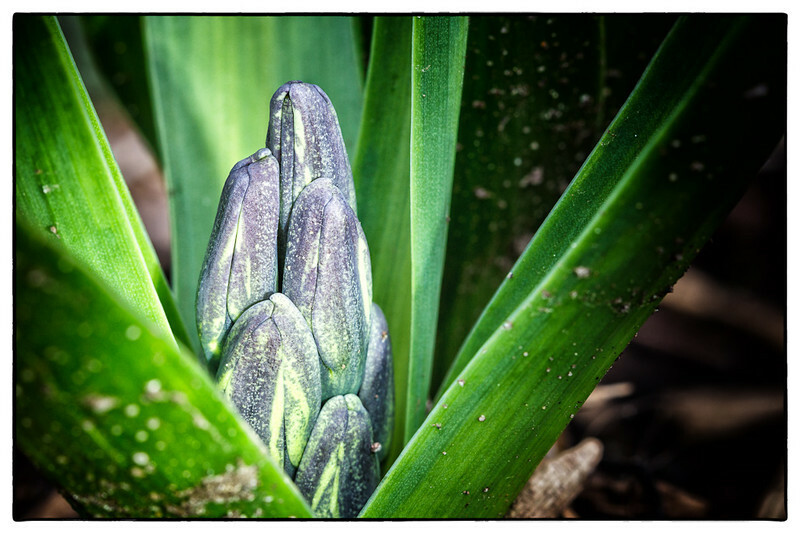 Daily photos from my 2012 365 project. My second shot with my new Canon G1X camera. Because the weather changed in a blink of an eye, I didn't have time to experiment with different settings. Although I'd thought I'd set the image type to RAW, I only shot jpgs. I am pleased with the tonal range though. I've since discovered there are settings to accommodate huge variances in dynamic range. That would have been great to try here! Oh well, I still need lots more play time before I'm comfortable with the new camera. Wanting to try out my new travelling camera, the recently launched Canon G1X, I headed to the harbour. As often happens on Georgian Bay, the weather turned in the blink of an eye! Almost as soon as I spotted the rainbow, the clouds blew in, swallowing it up. I was very disappointed when I returned home to find that I hadn't changed the image type to RAW, but the jpg does display a nice tonal range. Lots more play time is needed before I'm comfortable with the new camera. P.S. This shot was taken a week ago. 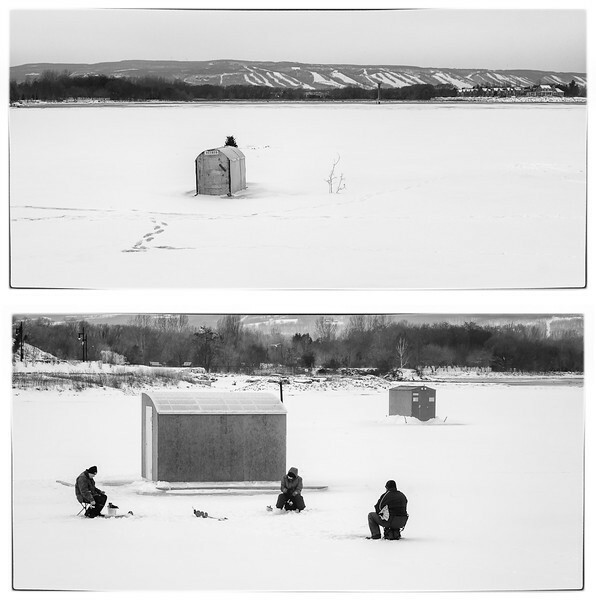 It was a relief to see the fish huts come off the harbour! 2012 - Day 39. Feb. 8, 2012. This may be an unusually mild winter but it's still pretty cold at the beach. The next beach shot I take will be warm and sandy, with fiery sunsets. See you in a couple of weeks! 2012 - Day 38. Feb. 7, 2012. 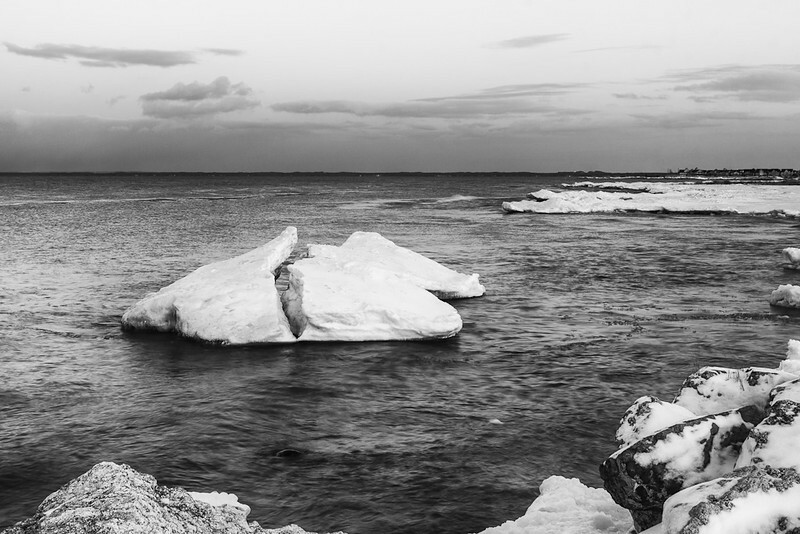 Ice mounds formed by wave action along the shoreline are breaking loose, setting adrift in the still open waters of Georgian Bay. 2012 - Day 37. Feb. 6, 2012. 2012 - Day 36. Feb. 5, 2012. Cold, damp and dull today but these fishermen seem to be enjoying their time on the harbour. I still find it difficult to believe the ice is thick enough! P.S. I have no idea what the little trees in the top half of the diptych are doing in the middle of the harbour! 2012 - Day 35. Feb. 4, 2012. 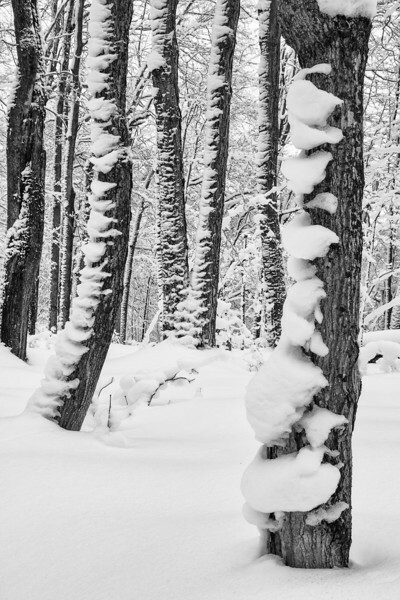 I took this shot earlier this week on a snowshoe hike on one of the trails within the town limits. 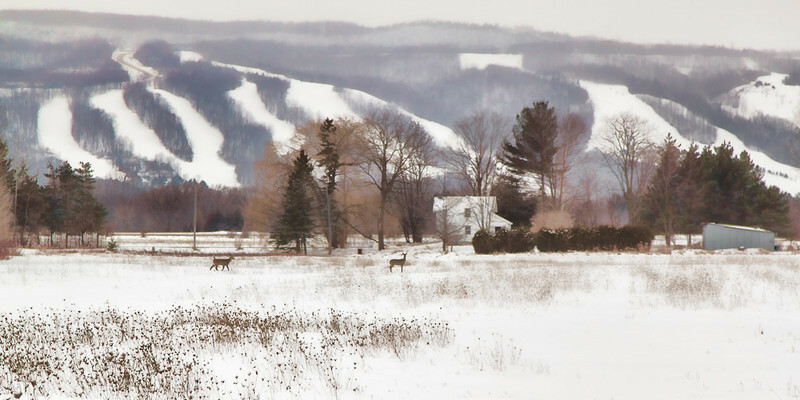 I had just turned onto Deer Trail, (honestly), to head back to my vehicle, enjoying the view of the field and ski hills beyond, when right on cue, the deer emerged from the woods. Although deer are quite plentiful, it amazes me to see these beautiful creatures in populated areas. I didn't post the shot earlier because frankly it's a poor photograph. The conditions were dull, dark, and flat, with so much moisture in the air you could almost grab it. I had my 24-105 lens on the camera and I was simply too far away to capture sharp detail. Yet, I couldn't relegate the shot to the trash bin. I've come back to it every day this week, looking for ways to overcome the weaknesses and salvage the strength. Today I decided to stop trying to make the photo into something it wasn't and just go with what was already there. I flattened the contrast and detail even more, boosted the vibrancy, (not quite the same as saturation), and bumped up the blacks. I'd liked the composition from the beginning, and I'm satisfied with the painterly quality of the processing. 2012 - Day 34. Feb. 3, 2012. 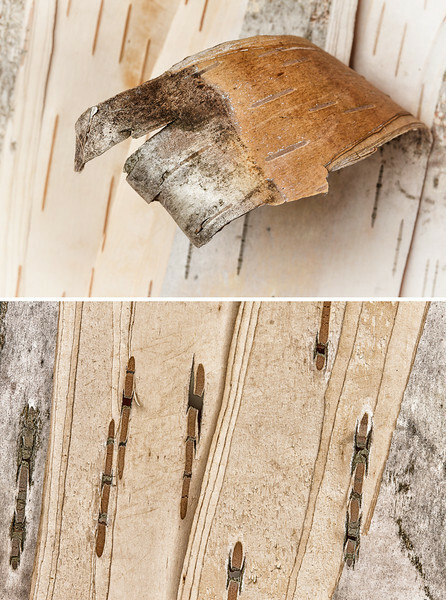 This peeling birch seemed to be trying to draw my attention, beckoning me to look closer. The texture revealed by my macro lens in the bottom half of the diptych is exquisite! It looks like a tribal art form. 2012- Day 33. Feb. 2, 2011. This poor little stream doesn't know if it should be freezing or thawing. That's been the story all winter with above normal temperatures. Groundhog Wiarton Willie emerged from his burrow this morning and pronounced an early Spring! We'll see. 2012 - Day 32. Feb. 1, 2012. This shot was taken at dusk. The fleeting hint of purples and pinks was chased away by rapidly approaching clouds. I'm playing with the effect of contrast and saturation on mood this week, and since the colour was less than spectacular anyway, I thought I'd try removing some of it. I started with the Bleach Bypass preset in Nik's Color Efex Pro 4, tweaked it to my liking, and then back in Lightroom adjusted the contrast. The resulting mood is cold and bleak. I like it. 2012 - Day 31. Jan. 31, 2012. 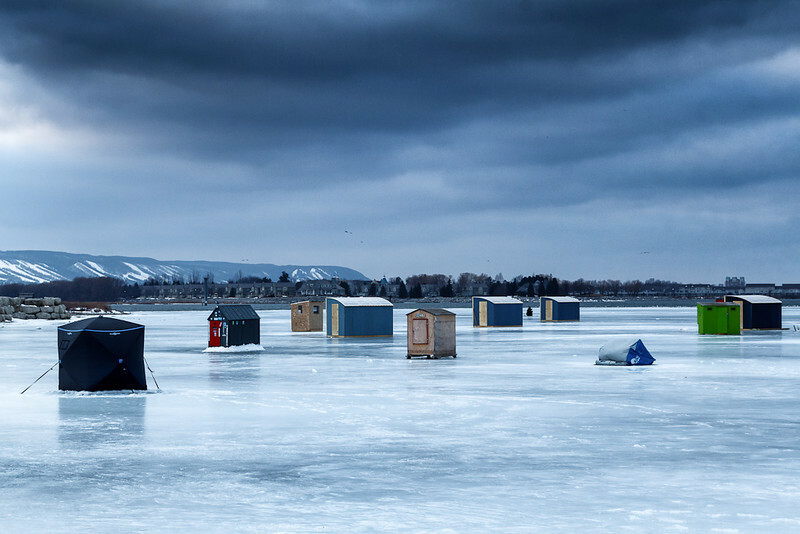 This is a fish hut on Collingwood harbour. I'm really surprised the ice is thick enough given the mild temperatures we've had this winter, but I guess these guys know what they're doing. In the background is the new Shipyards residential development. 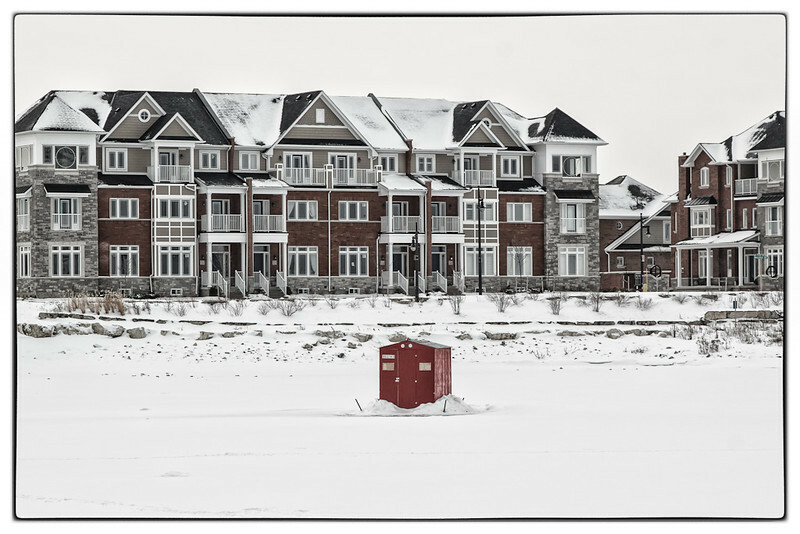 I was struck by the tonal similarities between the little fish hut and the large townhouses, and of course, I liked the contrast in scale. Today is one of those flat, dull, winter days with zero interest in the sky. I made basic exposure adjustments in Lightroom, and then in Nik's Color Efex Pro 4, I applied and tweaked the Bleach Bypass preset settings. If there's no interest in the sky you might as well blow it out ;-). I like the punch, desaturated feel and apparent white space. 2012 - Day 30. Jan. 30, 2012. I went snowshoeing this afternoon on the Eleventh Line Trail in Collingwood. This little stream should not be flowing in January; it should be frozen solid! The crazy winter we're having dumps snow on us, warms up above freezing, rains, freezes and then dumps more snow. 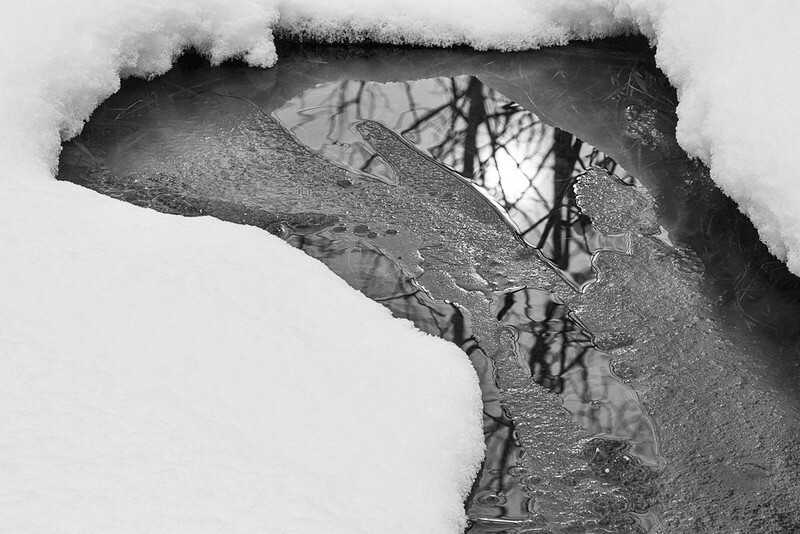 I love the ice formation jutting out from the submerged snow along the bank of the stream! 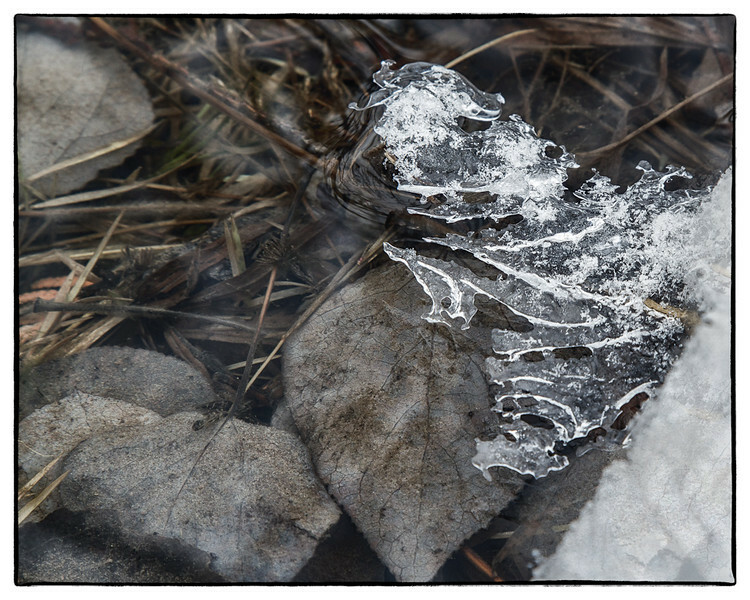 It looks like it's mimicking the shape and structure of the leaves in the freezing water below. In processing this shot I made basic exposure adjustments in Lightroom 4 Beta, combined several presets, starting with 'Dark Contrasts' in Nik's Color Efex Pro 4, and then finished off with a clarity adjustment back in Lightroom. 2012 - Day 29. Jan. 29, 2012. 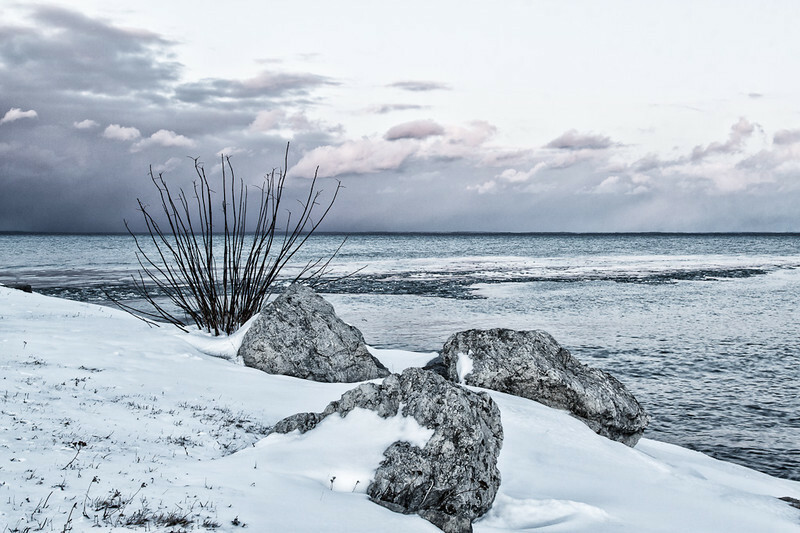 Taken at sunset in Collingwood's Sunset Point Park. 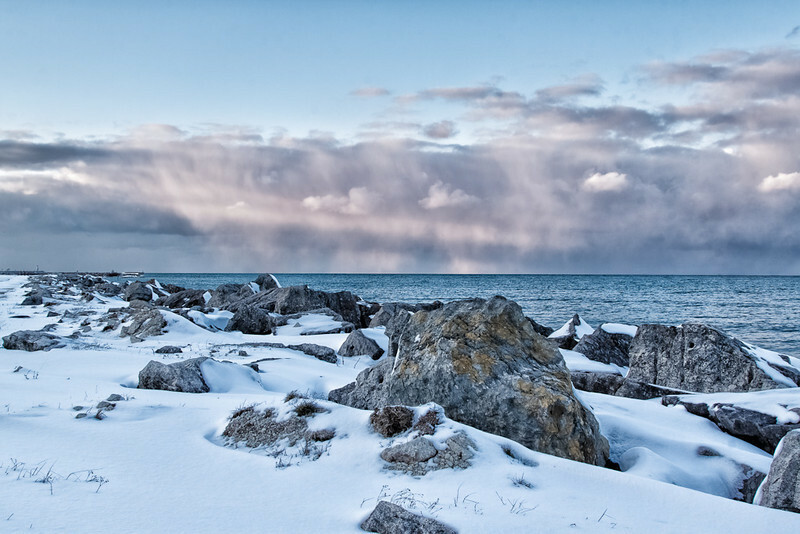 The open waters of Georgian Bay are breeding grounds for snow squalls. 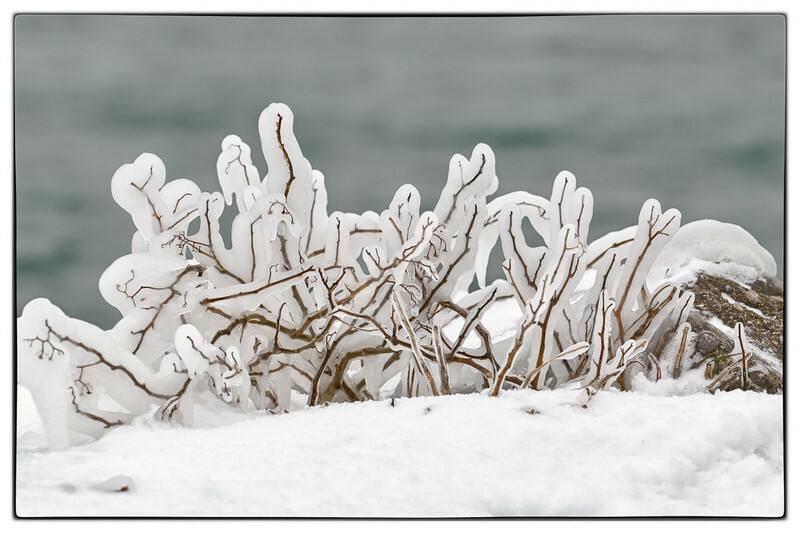 Environment Canada predicts lake effect streamers will drop about 15 cm. of snow on us tonight. That's not too bad. I was a little heavy handed with the sliders in Nik's Color Efex Pro 4, but I wanted to punch up the tonal contrast. It's getting close, but I don't think it's over the top. 2012 - Day 28. Jan. 28, 2012. Lazy, snowy, dull, grey day today. I didn't feel like leaving the house, but fortunately there's always something in the yard that catches my eye. 2012 - Day 27. Jan. 27, 2012. The question in my mind is not so much 'does it make a sound', but more 'will I fall over, or off the damn thing?'. 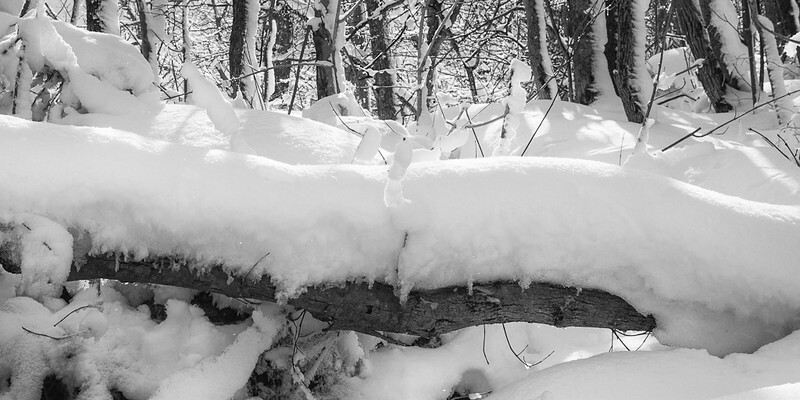 I took this shot last weekend, snowshoeing in the Pretty River Provincial Park, near Collingwood. I had considered crossing that 'bridge' and was shocked when I'd passed it to see the ravine under it. I get so caught up looking at the scenery through my mind's eye, that I have to remind myself to also scan the environment for hazards. 2012 - Day 26. Jan. 26, 2012. 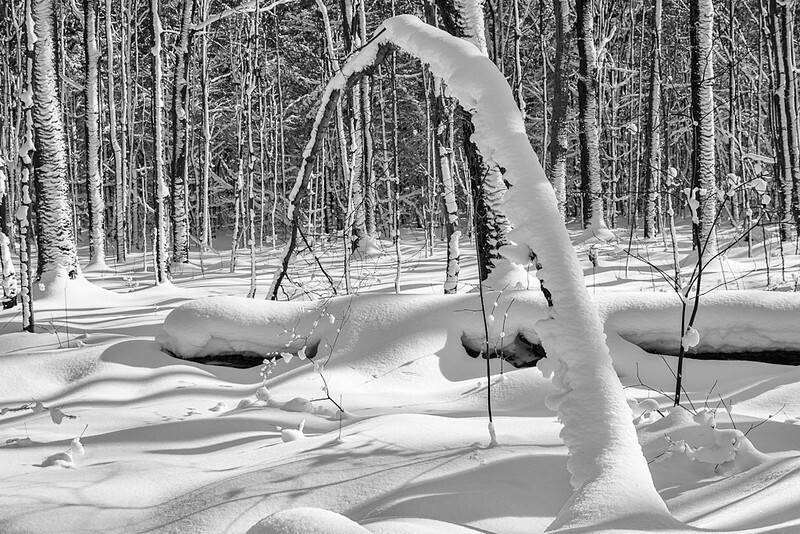 This is another shot from my snowshoe trek last weekend in the Pretty River Valley Provincial Park, near Collingwood. So, you might be wondering, what the heck is it? 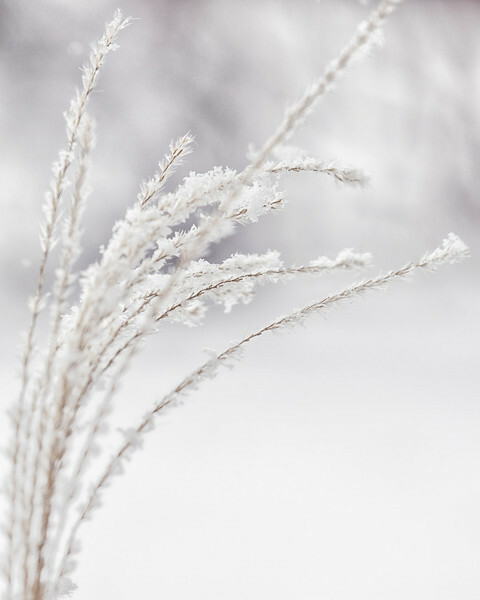 a flash freeze occurs when the temperature drops rapidly, within two to three hours, from above the freezing mark to below the freezing mark. 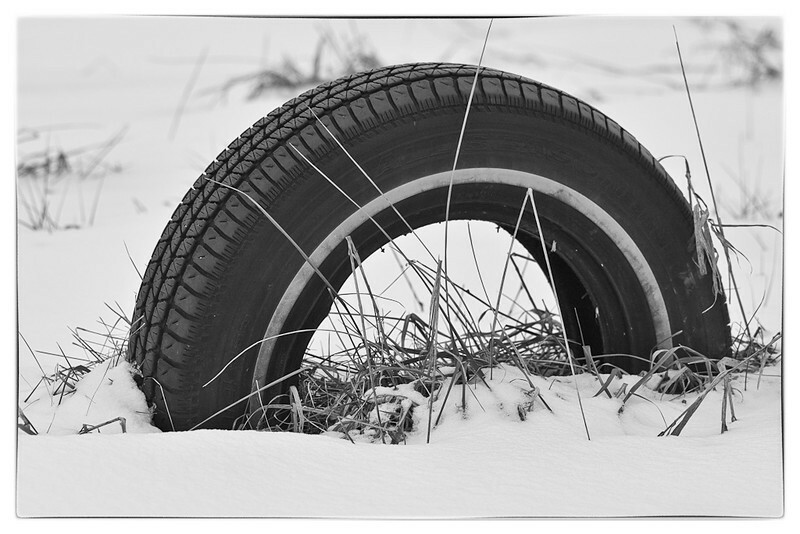 This causes roads and vegetation previously covered in rain or wet snow to freeze rapidly. This is unusual for us. Generally when winter comes the temperature drops below freezing and stays there. It had been raining the day before we went snowshoeing. The temperature dropped, all the raindrops clinging to the tree branches froze, and then it snowed. 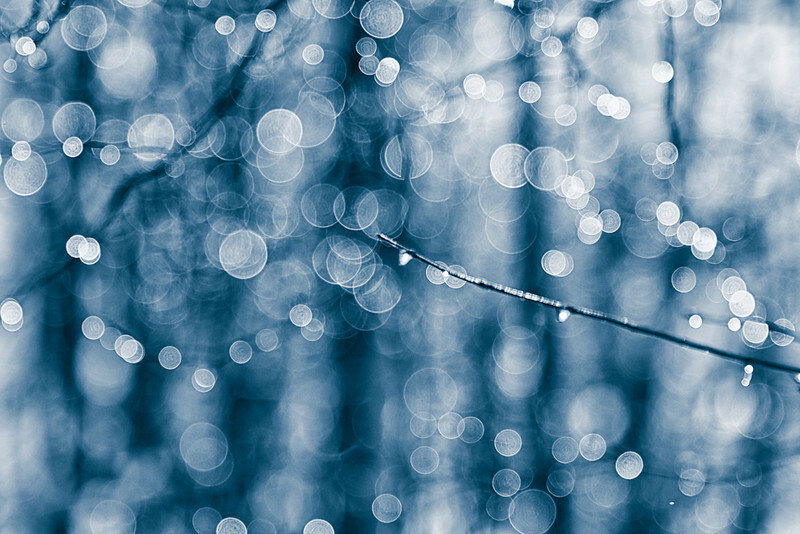 The branches sparkled, as though they all were sporting tiny diamonds. I used a soft focus on one branch and opened my aperture as wide as it would go, resulting in incredible bokeh. It made me think of molecules frozen in the air. I wanted a cold feeling, so I converted the photo to black and white in Silver Efex Pro 2, and then back in Lightroom boosted the contrast, added a blue tone to the shadows, and brought up the structure of the bokeh with the clarity slider. Et voilà - my interpretation of a flash freeze! 2012 - Day 25. Jan. 25, 2012. Taken this past weekend in Nottawasaga Valley Provincial Park near Collingwood. 2012 - Day 24. Jan.24, 2012. I took this shot on the weekend in the Pretty River Valley Provincial Park near Collingwood. The hibernal wind, (as wacky as it is this winter), has clumped the snow like fungi on the trees. 2012 - Day 23. Jan. 23, 2012. 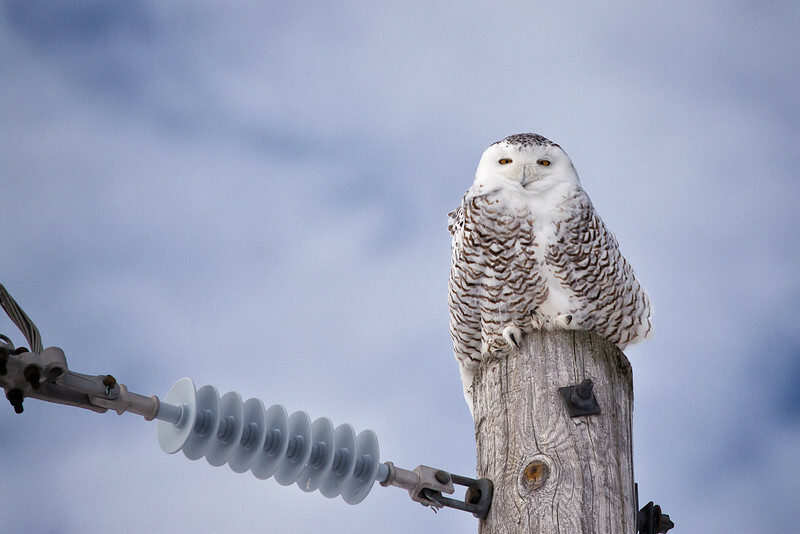 The snowy owl usually resides in the Arctic tundra but migrates south to hunt during the winter months. While they're often reported as winter visitors to Northern Ontario,we rarely see them this far south. 2012 - Day 22. Jan. 22, 2012. Most of my views from the escarpment look out over the bay. 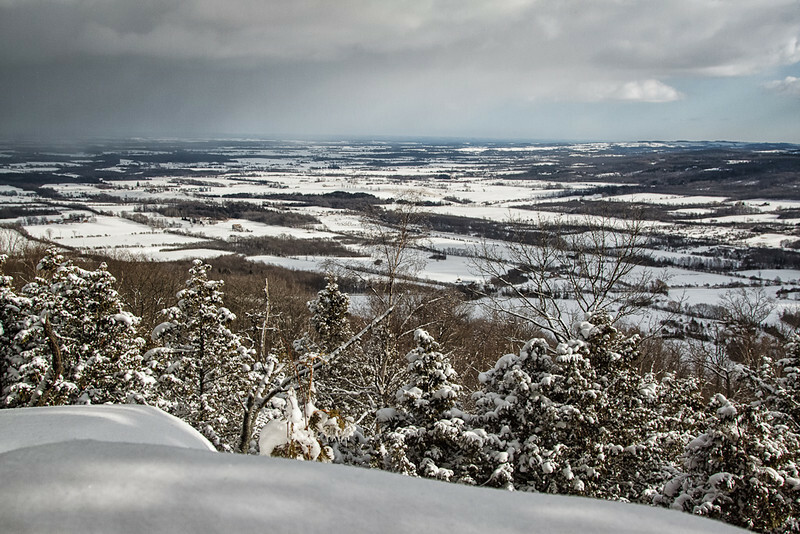 Yesterday we snowshoed in the Pretty River Valley Provincial Park just southwest of Collingwood. This lookout point on the Russ McConnell side trail provided a beautiful vista of the Pretty River Valley. If you look to the left you can see the snow flurries approaching. 2012 - Day 21. Jan. 21, 2012. I went snowshoeing this afternoon for the first time this winter. 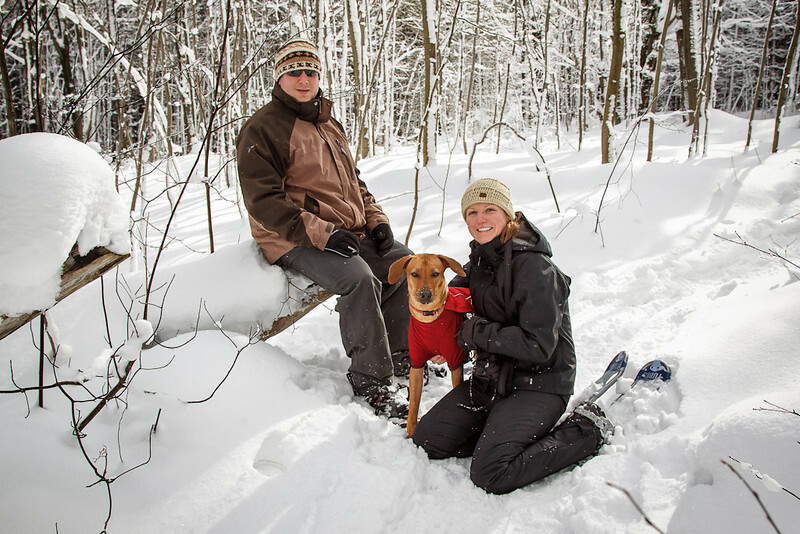 This is a pic of our son Mark, daughter-in-law Krista, and grandpuppy Nala. It was a glorious day to be out in the woods! Thanks so much guys for inviting me to tag along! 2012 - Day 20. Jan. 20, 2012. Thanks so much everyone for your kind words about this series! 2012 - Day 19. Jan. 19, 2012. Of all the animals I photographed last Sunday at the Muskoka Wildlife Centre, this is the one that most spoke to my soul. As I mentioned when I posted my first pic of him ( http://www.flickr.com/photos/dibytes/6706675003/in/photostream ) , Kokanee was born in captivity. He doesn't know the wild and is ill-prepared to cope with the harsh realities of survival in a rapidly disappearing natural environment. To faciliate our photoshoot the animal handlers brought the animals into the large enclosures we were using. 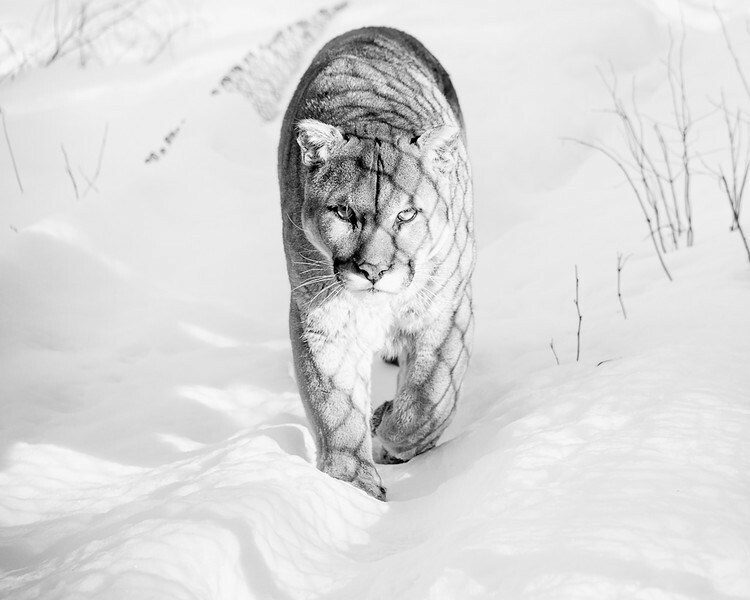 Cougars are, after all, cats, and prefer to walk on cleared pathways. In this shot Kokanee had moved up the hill to the pathway that was closest to the enclosure fence, thus walking through the shadows cast by the fence. Several of my fellow photographers asked the handlers to entice Kokanee down to one of the lower pathways, further from the fence. I liked the 'story' of the shadows, so I scrambled further up the hill and managed to meet Kokanee eye to eye. I have to tell you a shiver went through me as I sensed the spirit of this beautiful animal! 2012 - Day 18. Jan. 18, 2012. Another shot from Sunday's photoshoot at the Muskoka Wildlife Centre. 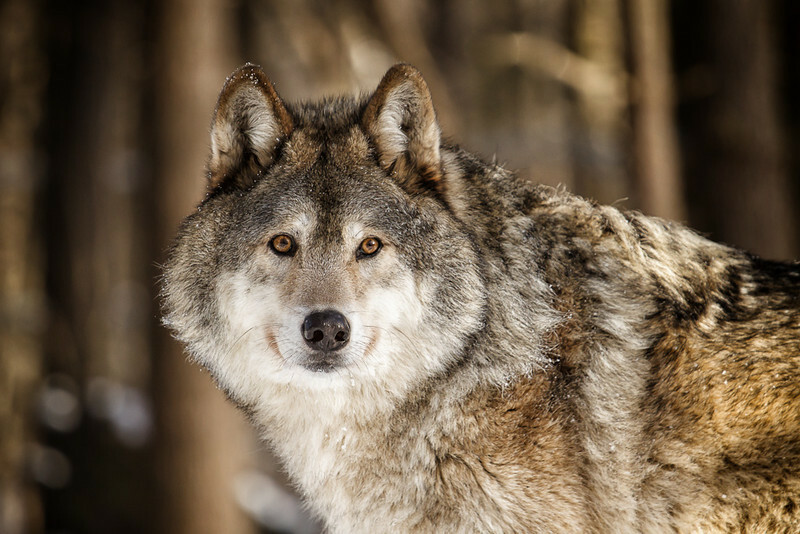 Meet Akayla, an 11 year old male gray wolf. He was born at a zoo in Montana. The zoo didn't have enough room in the wolf enclosure to sustain all the pups that were born that year, so Akayla and his sister were donated to the centre. You can also see Akayla here ( http://www.flickr.com/photos/dibytes/6721685969/in/photostream ) and here ( http://www.flickr.com/photos/dibytes/6721685569/in/photostream/ ) . 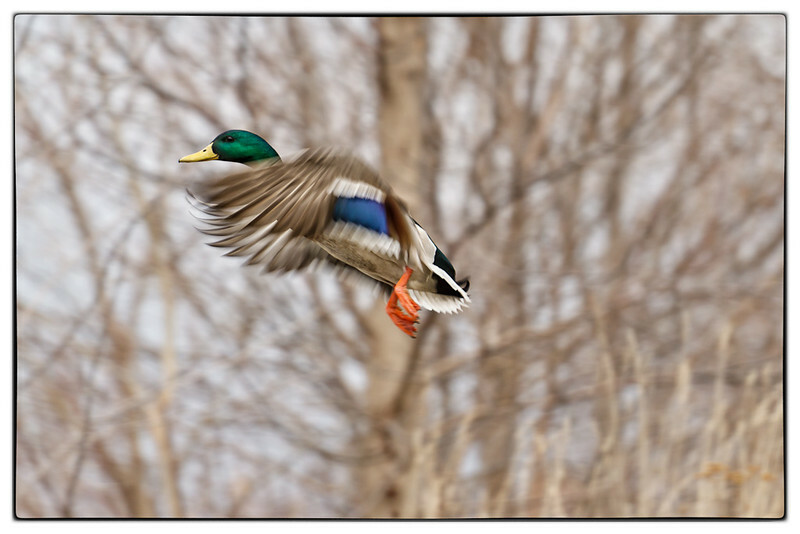 Another shot from Sunday's photoshoot at the Muskoka Wildlife Centre. Meet Akayla, an 11 year old male gray wolf. He was born at a zoo in Montana. The zoo didn't have enough room in the wolf enclosure to sustain all the pups that were born that year, so Akayla and his sister were donated to the centre. You can also see Akayla here ( http://www.flickr.com/photos/dibytes/6721687239/in/photostream/ ) and here ( http://www.flickr.com/photos/dibytes/6721685569/in/photostream/ ) . 2012 - Day 17. Jan. 17, 2012. 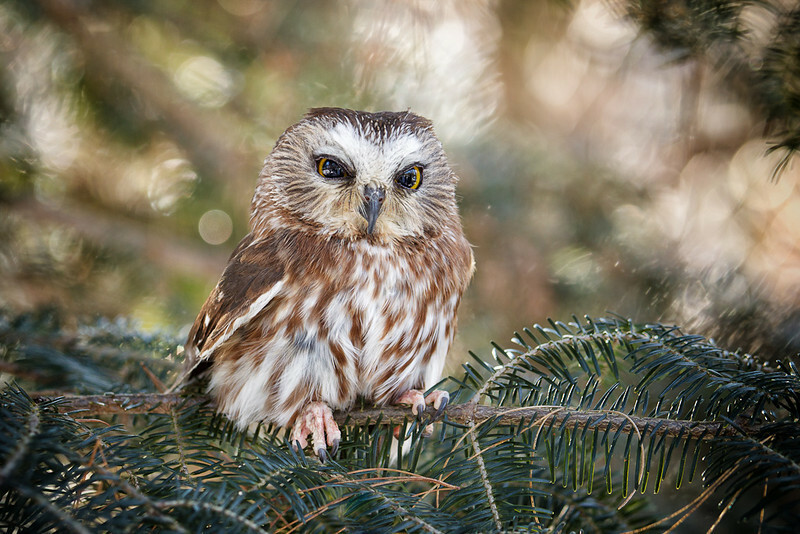 I couldn't resist posting another shot of this beautiful saw-whet owl! Read Luna's story here ( http://www.flickr.com/photos/dibytes/6712762185/in/photostream/ ) and get a sense of her size here ( http://www.flickr.com/photos/dibytes/6712761793/in/photostream/ ) . 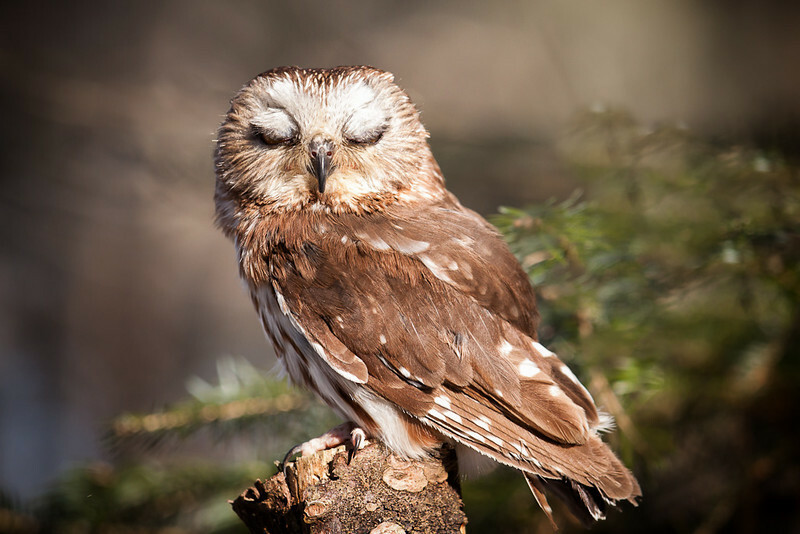 Meet Luna the saw-whet owl! She was found injured in a backyard near Peterborough, Ontario. Although her shoulder has healed, it was felt that it was no longer strong enough for Luna to be able to hunt for herself. She now lives at the Muskoka Wildlife Centre and has become quite the starlet. Have you ever seen the Telus commercial with the cute little owl? That's Luna! She's a tiny little thing but has the presence of a professional model. I took a shot of her with one of the other photographers ( http://www.flickr.com/photos/dibytes/6712761793/in/photostream ) to give you a sense of scale. 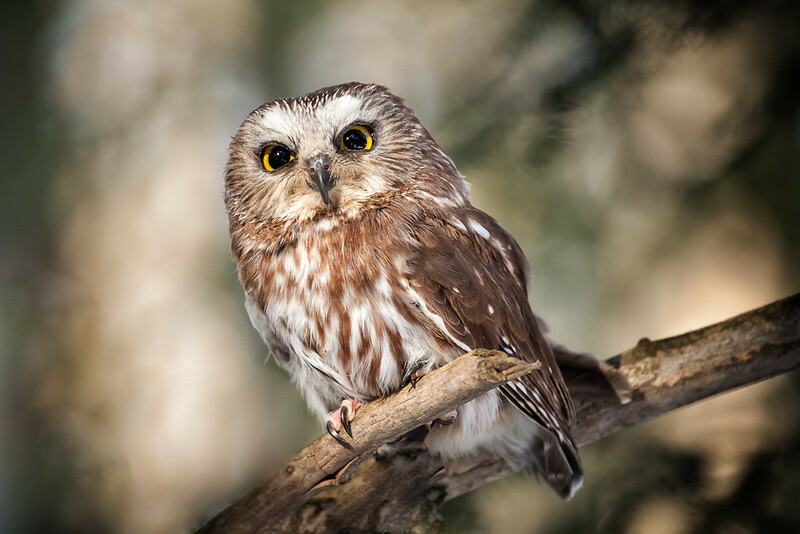 Meet Luna the saw-whet owl! Please see my other shot of her ( http://www.flickr.com/photos/dibytes/6712762185/in/photostream/ ) for her complete story. 2012 - Day 16. Jan. 16, 2012. Another shot from yesterday's photoshoot at the Muskoka Wildlife Centre. 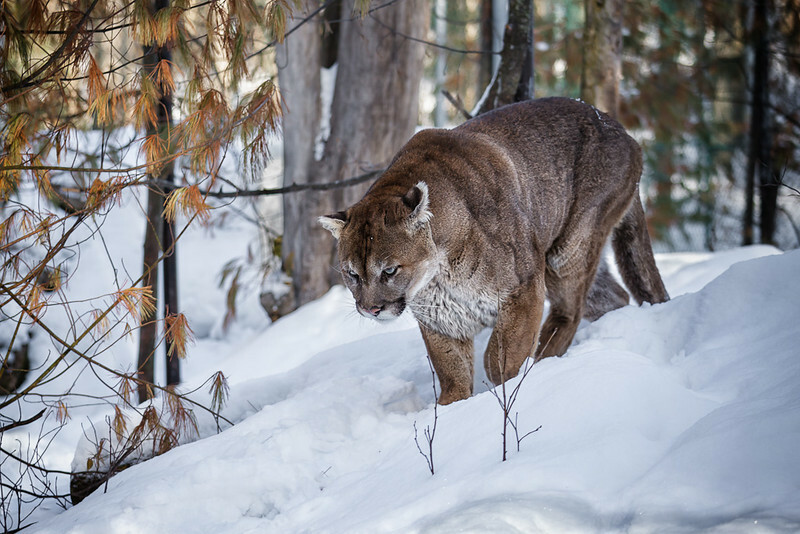 This is Kokanee, a cougar born in captivity and hand raised. For this reason he cannot live in the wild, but will be a permanent resident at the centre. He's a stunningly beautiful creature! 2012 - Day 15. Jan. 15, 2012. What a fabulous day I had at the Muskoka Wildlife Centre, even though temperatures were frigid! We started off at -27C and warmed up to -14C by the afternoon. Many layers of thermal clothing and hot pockets in my gloves kept me fairly comfortable. I met a great group of photographers and appreciated the insight provided by our guide photographer Ray Barlow ( http://www.raymondbarlow.com/ ) . As I mentioned yesterday, the Muskoka Wildlife Centre is not a zoo, but a rehabilitative centre. Founder Dale Gienow guided our visits with the centre residents. His love of, and respect for, the charges in his care was evident throughout the day. I'm still going through the hundreds of shots I took of each animal and will share my favourites with you throughout the next week. 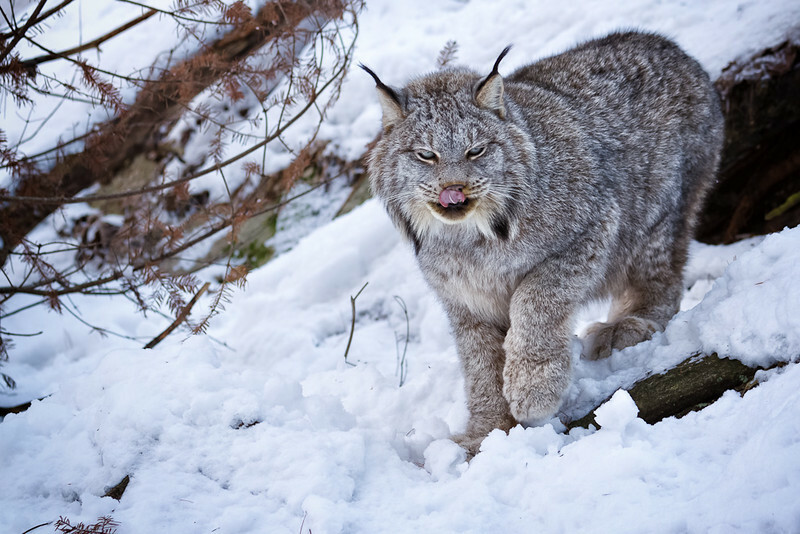 Since I'm a cat person, I thought I'd start us off with Yeti, an 11 year old female Canada Lynx. She came to the centre from a fur farm, when she was 10 days old. She was hand raised and now takes part in outreach programs to schools in Ontario. Although she is accustomed to people, she is not a house cat. I, for one wouldn't care to be on the receiving end of a swipe from one of those paws! 2012 - Day 14. Jan. 14, 2012. 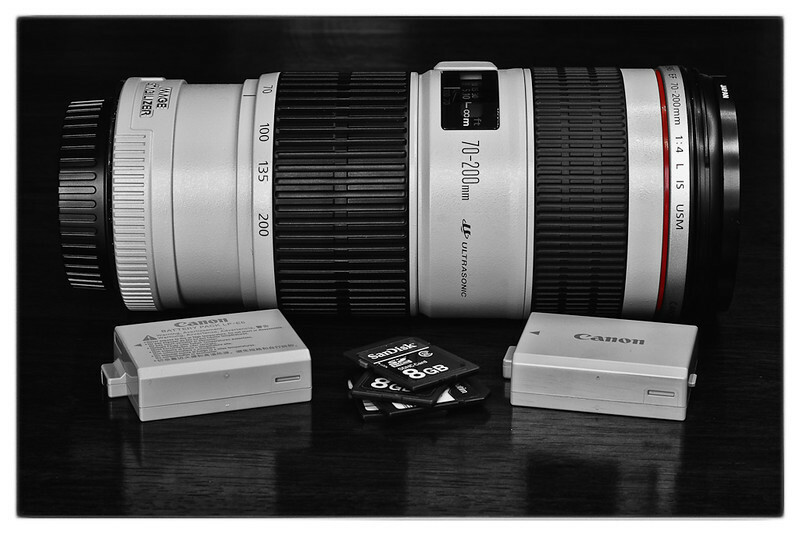 I'm packing up my gear for what I hope will be an amazing photoshoot tomorrow! 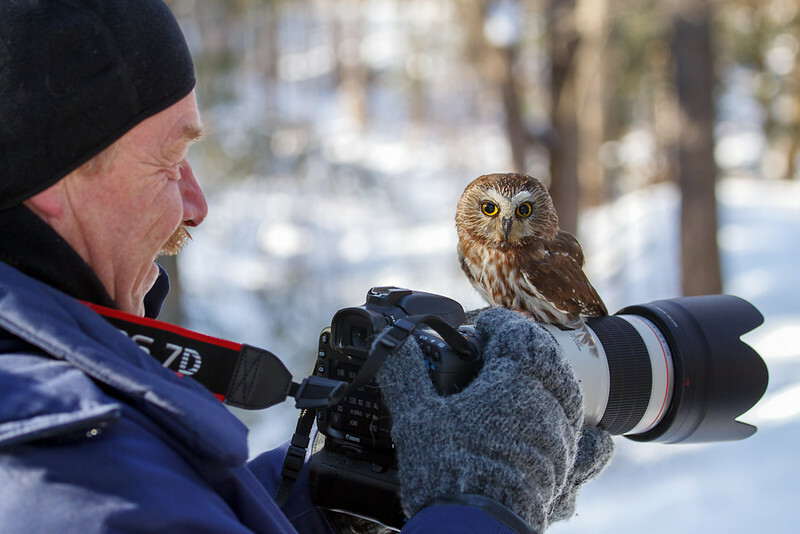 I'm going with a small group of photographers to The Muskoka Wildlife Centre. This is not a zoo, but a rehabilitative centre that is home to previously injured and now un-releasable wildlife, native to Ontario. We will be taken into the fifty acre, natural, fence free facility by the animal handlers. 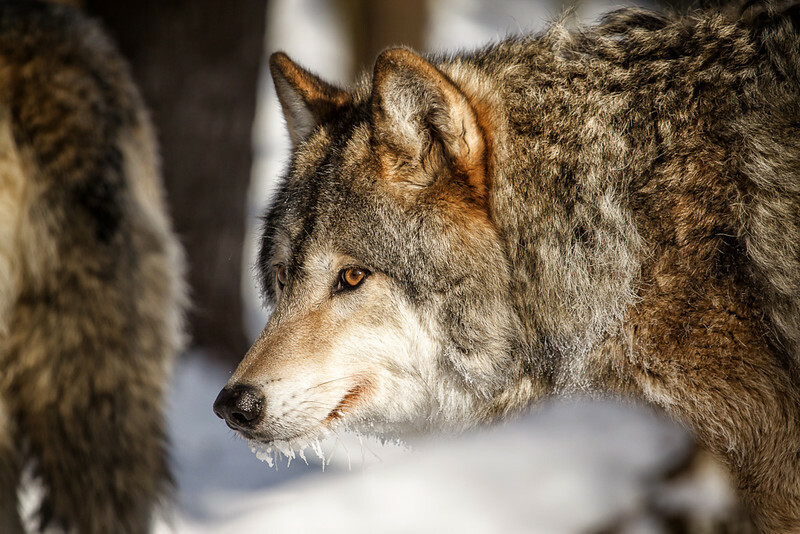 We'll have access to cougars, lynx, wolves and more. Please send warm thoughts my way as we're in the grip of an Arctic air mass right now! When I arrive tomorrow morning the temperature is expected to be -26C, without the wind chill, rising to -11C in the afternoon. I decided to show you this gear and not the thermal underwear I've dug out ;-). I have three batteries, which I hope will last, and 'hot pockets' that I'll place in the flap that folds back to expose my fingers in my gloves. I have fingers crossed that my camera is up to the challenge! 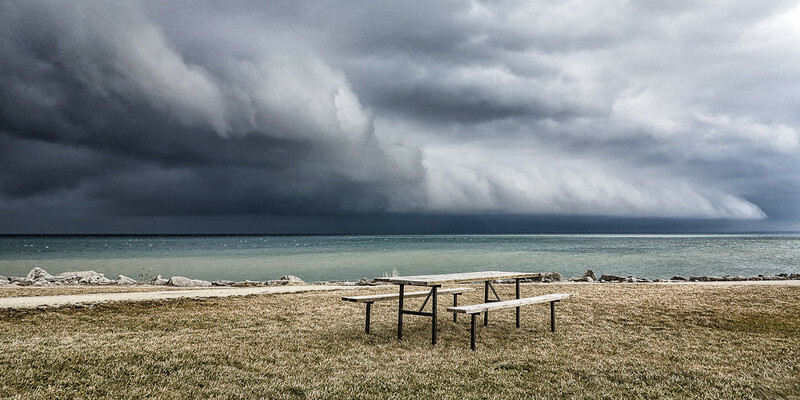 Snow squalls and a good book, (Photographically Speaking: A Deeper Look at Creating Stronger Images, by David DuChemin), are keeping me indoors today. On days like this, my first thought for my pic of the day goes to my macro lens. 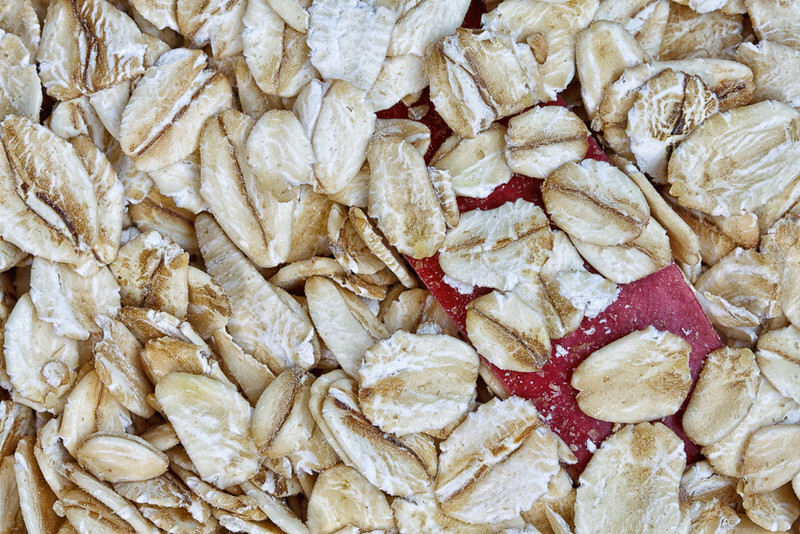 This is oatmeal, ready to be cooked. I quite often add apple slices for sweetener. It's a heart healthy stick-to-the-ribs breakfast on a wintry day. 2012 - Day 12. Jan. 12, 2012. 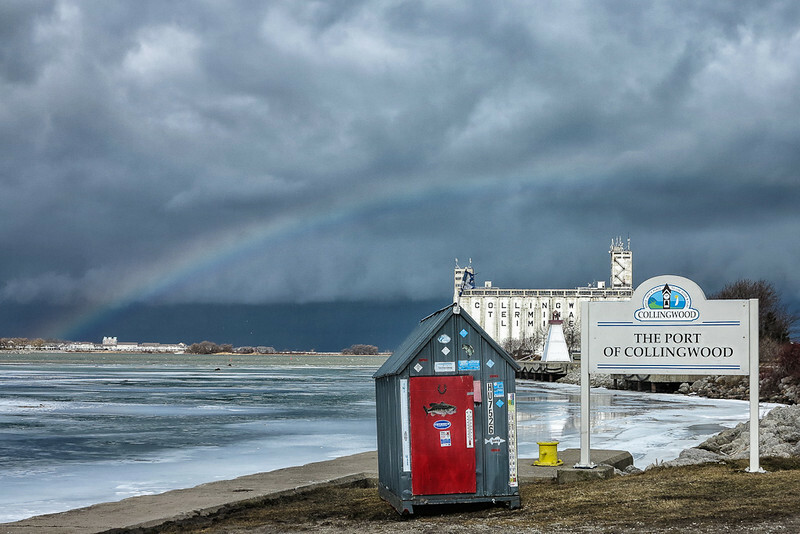 When I took this shot in Collingwood's Millennium Park this afternoon, it was snowing gently, with the temperature hovering at freezing, and no wind chill to speak of. Since I wasn't freezing to death or fighting to keep from being blown into the bay, I was able to really appreciate the beauty of the colour palette. I'd set the white balance on my camera to cloudy, which added the right touch of warmth. I didn't worry about the blue cast to the snow because that's what my brain registered. I've been using Nik's Color Efex Pro 4 to adjust the contrast of my photos lately. Today I played with the 'dark contrast' settings. At full strength the scene looked very HDR-ish, (in a bad way), but I was able to use a much lighter touch with the controls. 2012 - Day 11. Jan. 11, 2011. 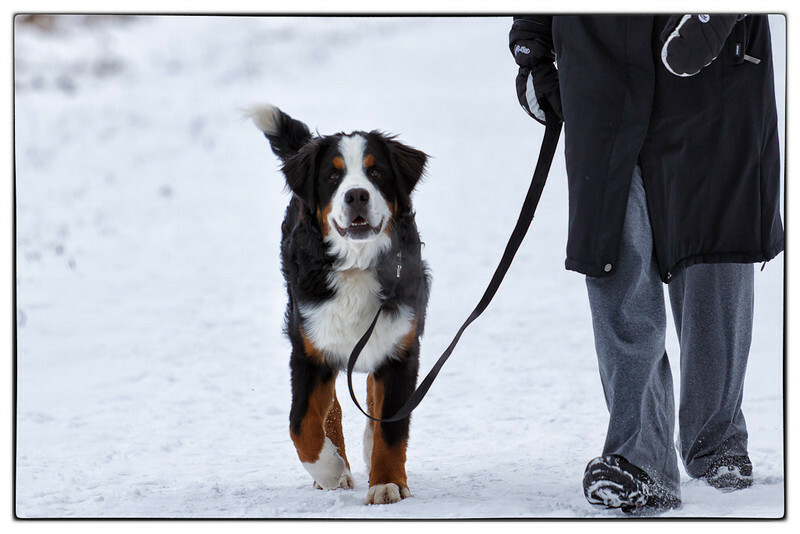 I often meet dogs and their owners on Collingwood's trail system. While I've been flattened by out of control dogs a couple of times, I was impressed with the demeanor of this young fellow. He was extremely well behaved! He sat when told, as his owner reattached his lead at my approach, and greeted me courteously :-). Beautiful animal! 2012 - Day 10. Jan. 10, 2011. This is an interesting use for old tires. A homeowner bordering part of Collingwood's trail system has embedded used tires in a line along the edge of his property. I'll have to go back there in the summer to see what's growing. Wildflowers would make a nice contrast. 2012 - Day 9. Jan. 9, 2011. The harbour is freezing over but there's still mostly open water in the bay, a treat for the water fowl this time of year. I managed to catch this guy during takeoff. I'm not sure why I hadn't noticed before how flat their bellies are, (she says enviously). 2012 - Day 8. Jan. 8, 2012. The waterways in the area haven't frozen over yet as our daytime temperatures have hovered at, or slightly above, the freezing point. 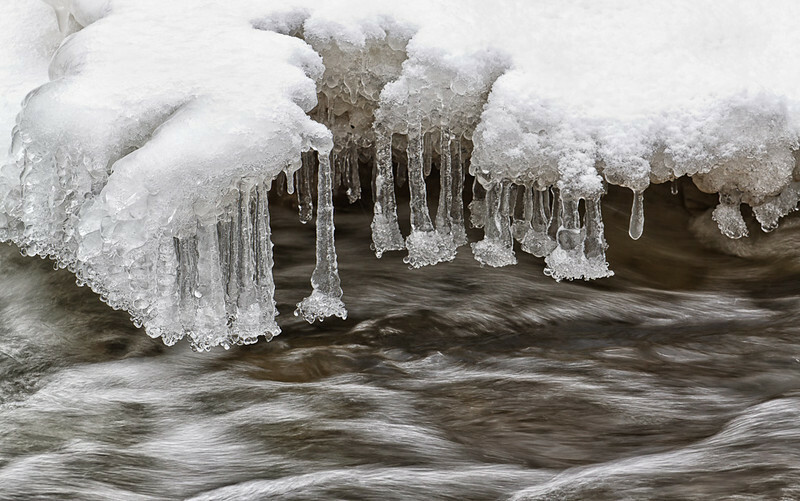 The banks of Black Ash Creek, near my home, are sporting beautiful ice structures from the spray of the rapidly flowing water. 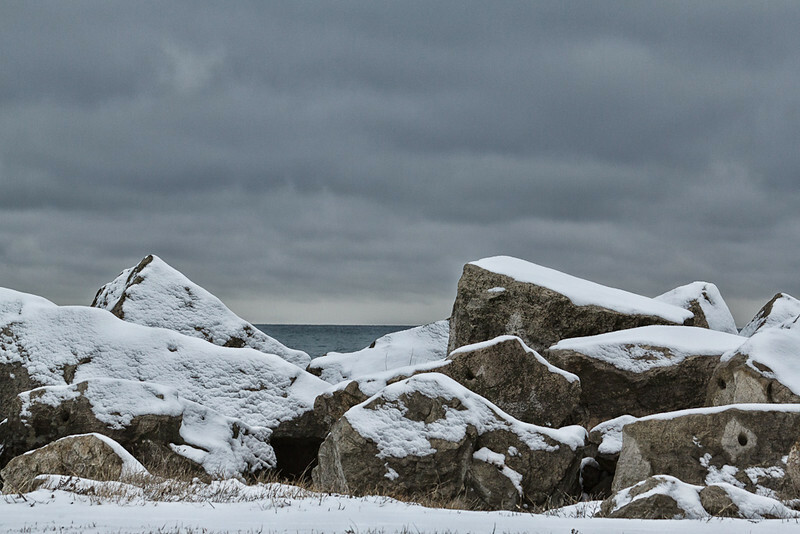 This is not a black and white conversion, but a naturally monochromatic scene. I used my camera's cloudy setting to set the white balance, and then bumped up the temperature a tiny bit, to remove the last of the cold blue tinge. It still reads cold without the blue. 2012 - Day 7. Jan. 7, 2012. 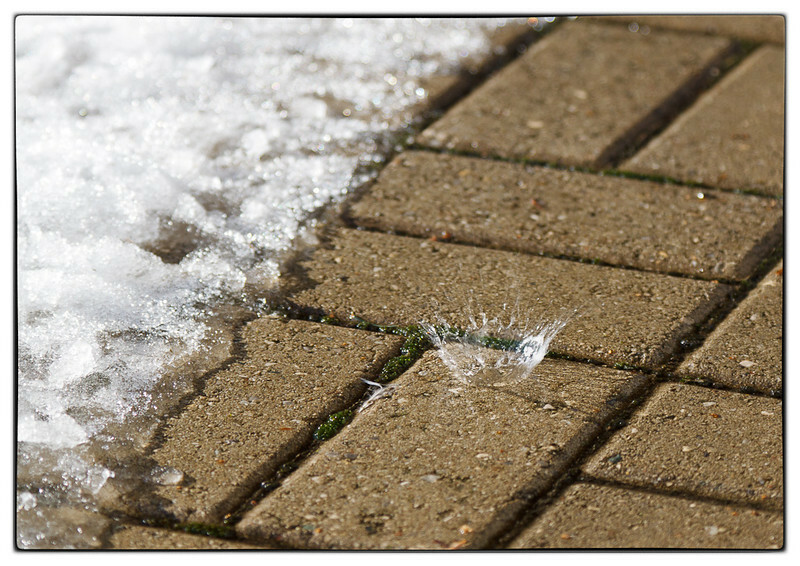 It seems strange to have a January thaw when we've barely had winter, but my patio is reappearing as the snow recedes. I was able to capture this drip from the eaves. 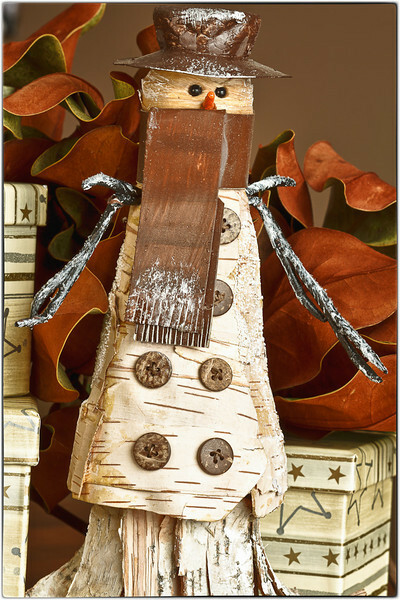 The forecast calls for dropping temperatures and a skiff of snow tonight. 2012 - Day 6. Jan. 6, 2012. This is a macro shot, (processed with Nik's HDR Pro), of my newly arrived, top of the line, XPS 8300 Dell. 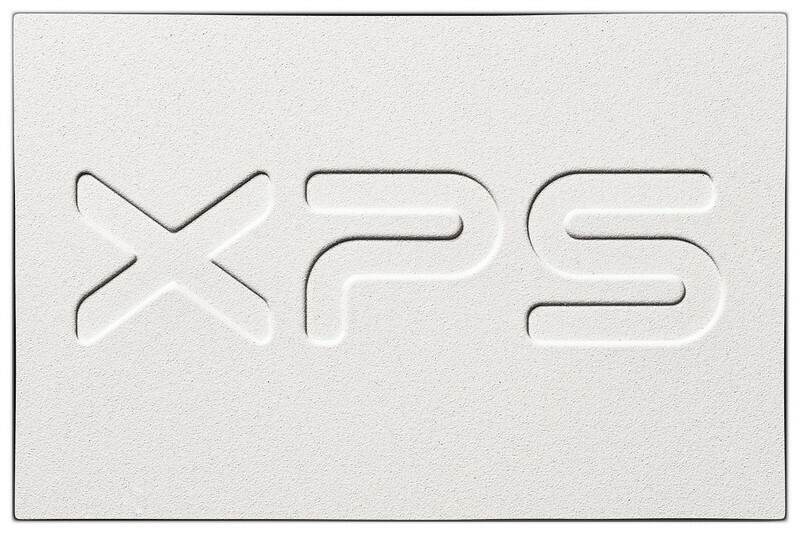 It's been quite some time since I've had a desktop computer, but this beast is touted as having 'premium processors that deliver razor-sharp graphics'. From the little bit that I've played with it, after spending most of the day setting it up, I can say that it does appear to have lightning fast image rendering. My poor old laptop made a valiant attempt at handling Lightroom, but it was starting to choke when I added the Nik plugin layer. This new work horse doesn't even break a sweat...and...I can store my pics on the local, as opposed to external, hard drive. So far, so good! 2012 - Day 5. Jan. 5, 2012. Mother Nature is at work building ice sculptures along the waterfront. Every wave and every spray adds another layer to her art. This is a composite of 3 exposure bracketed shots, combined in Nik's HDR Pro. I used a very light touch to improve the exposure, add a bit of depth that was hard to achieve in the flat light, and still keep the scene looking as natural as possible. 2012 - Day 4. Jan. 4, 2012. A rosehip in Dad's memorial garden. Since the light was so flat and dark I took 3 exposure bracketed shots, and combined them in Nik's HDR Pro. 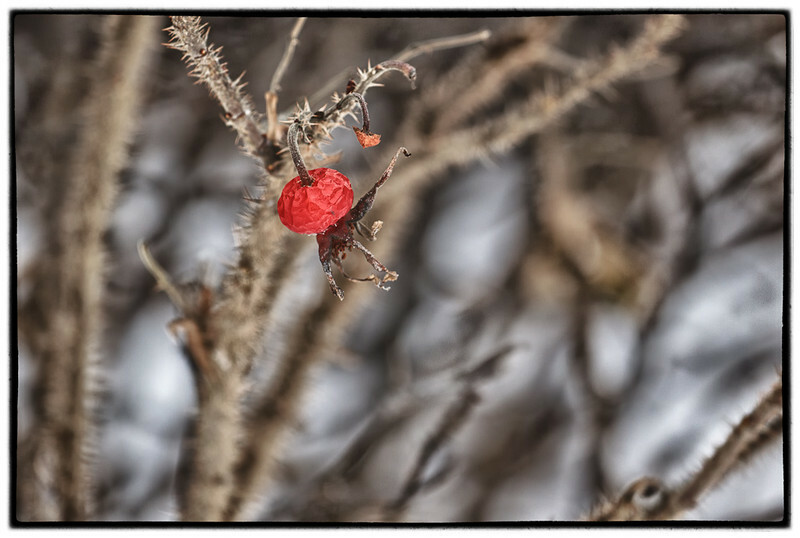 I kept the rosehip looking fairly natural, but let the background bushes go a little more surreal. 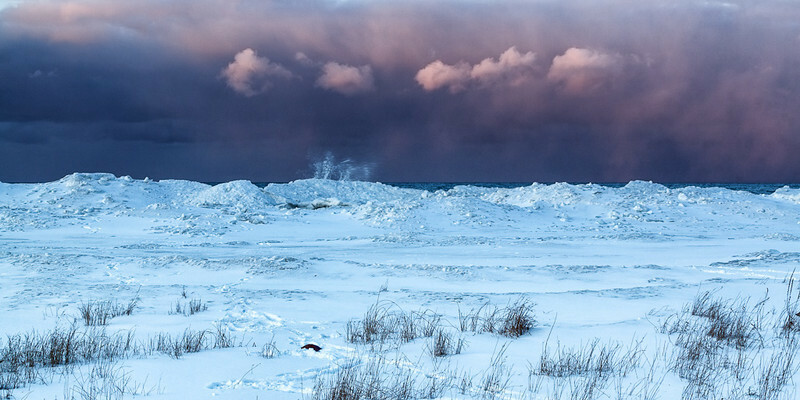 I think it emphasizes the harshness of the winter environment. 2012 - Day 3. Jan. 3, 2012. The waterfront becomes encased in ice one layer at a time. This is a very different scene compared to a year ago. 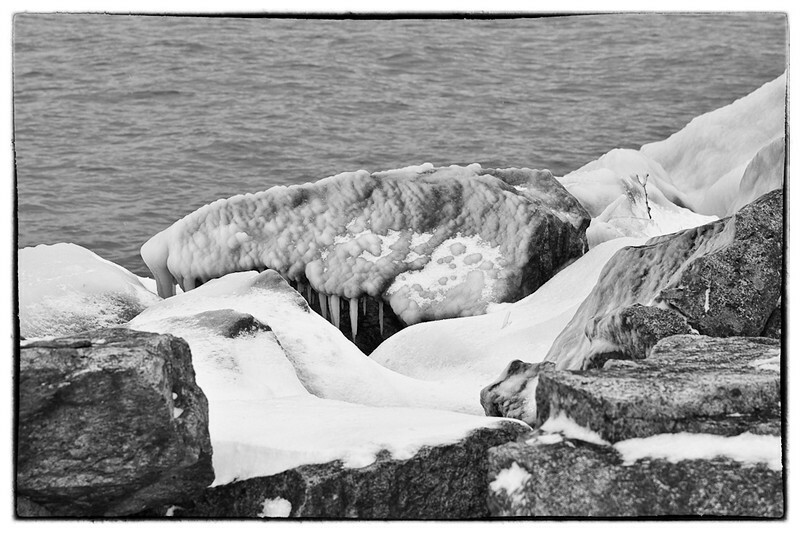 With our warmer temperatures this fall and so far this winter, the bay is just starting to freeze now. A year ago this very spot was buried in several feet of snow and ice. Where you see the icicle teeth forming in the centre of the photo is where I fell through the snow bridge last year, getting my leg wedged between the rocks. I keep photographing the spot to remind myself not to be so stupid! 2012 - Day 2. Jan. 2, 2012. We spent a wonderfully lazy day today. We're sitting under snow squalls streaming off Georgian Bay, with the wind chill dipping into the minus 20s, so we didn't leave the house. 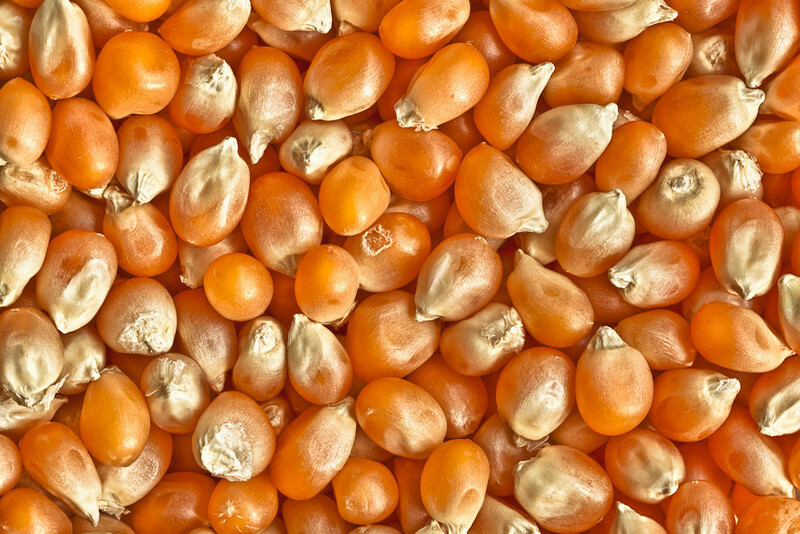 It was the perfect afternoon to try out the new popcorn popper and curl up with a movie! This shot was taken with my macro lens. It's a composite of three exposure bracketed shots, merged in Nik's HDR Pro. I like the result. I think it has structural and tonal interest, without being over the top. See You Next Christmas, Little One! 2012 - Day 1. Jan.1, 2012. I'm packing up the Christmas stuff today. This little guy formed part of an arrangement on my mantle. I'll miss him. Happy New Year everybody!